For those who want the psychic-type Pokémon Deoxys for their Pokémon Diamond or Pokémon Pearl Nintendo DS, could have their dreams fulfilled. 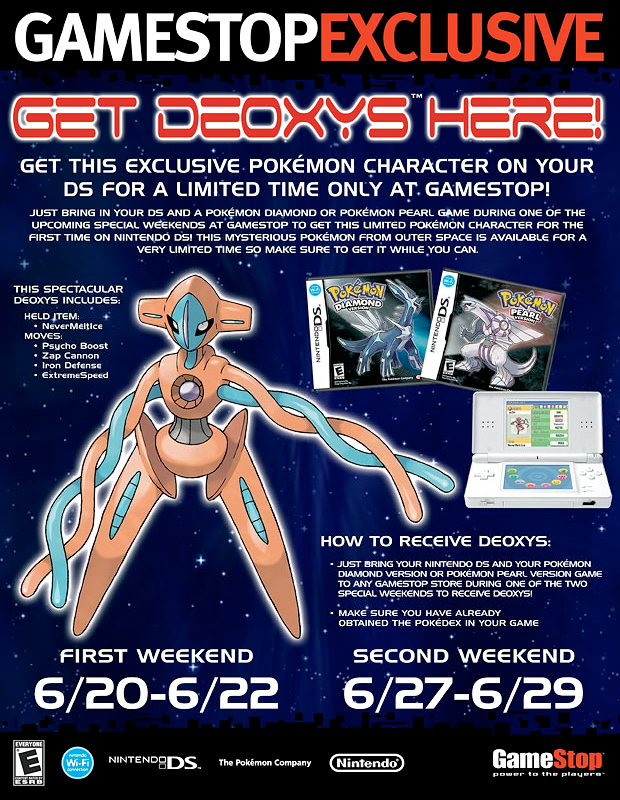 Just a little heads up, GameStop is distributing Deoxys. You will be able to get the Pokémon in participating Game Stops during the 20, 21, 22, 27, 28, and 29 of this month. Just a reminder you need the Pokédex to actual get the Pokémon. This entry was posted on Tuesday, June 10th, 2008 at 8:10 pm and is filed under Uncategorized. You can follow any responses to this entry through the RSS 2.0 feed. You can leave a response, or trackback from your own site. Fantastic! Some valid details and examples has been utilized in the write-up. All around, great article and outstanding web site! This kind of frequently amazes me ways web owners that include on your own are able to see a time while using the commitment which keeps at offering marvelous blogposts. Your site issuperb the other of the actual will want to examine unique web sites. I recently must thank you. I have acquired some new elements from your site about computer systems. Another thing I have always considered is that laptop computers have become a product that each home must have for most reasons. They provide convenient ways in which to organize households, pay bills, go shopping, study, pay attention to music as well as watch tv shows. An innovative method to complete most of these tasks is by using a computer. These personal computers are mobile, small, effective and transportable. Im glad for the article install.Truly search forwards to read solon. Untold obligated. I’m extremely inspired together with your writing talents as well as with the layout on your weblog. is uncommon to see a nice weblog like this one nowadays.. Thanks for ones marvelous posting! I definitely enjoyed reading it, you can be a great author.I will be sure to bookmark your blog and will come back down the road. I want to encourage you to continue your great writing, have a nice day!